When working in a laboratory, it is imperative to minimize sources of contamination. Aseptic technique refers to procedures that permit transfer of cultures and reagents while avoiding contact with non-sterile surfaces. Serological pipettes and micropipettors are used to measure precise volumes without compromising sterility of solutions used in experiments. Sanders, E. R. Aseptic Laboratory Techniques: Volume Transfers with Serological Pipettes and Micropipettors. J. Vis. Exp. (63), e2754, doi:10.3791/2754 (2012). Microorganisms are everywhere - in the air, soil, and human body as well as on inanimate surfaces like laboratory benches and computer keyboards. The ubiquity of microbes creates a copious supply of potential contaminants in a laboratory. To ensure experimental success, the number of contaminants on equipment and work surfaces must be minimized. Common among many experiments in microbiology are techniques involving the measurement and transfer of cultures containing bacterial cells or viral particles. To do so without contacting non-sterile surfaces or contaminating sterile media requires (1) preparing a sterile workspace, (2) precisely setting and accurately reading instruments for aseptic transfer of liquids, and (3) properly manipulating instruments, cultures flasks, bottles and tubes within a sterile field. Learning these procedures calls for training and practice. At first, actions should be slow, deliberate, and controlled with the goal being for aseptic technique to become second nature when working at the bench. Here we present the steps for measuring volumes using serological pipettes and micropipettors within a sterile field created by a Bunsen burner. Volumes range from microliters (μl) to milliliters (ml) depending on the instrument used. Liquids commonly transferred include sterile broth or chemical solutions as well as bacterial cultures and phage stocks. By following these procedures, students should be able to: •Work within the sterile field created by the Bunsen burner flame. •Use serological pipettes without compromising instrument sterility.• Aspirate liquids with serological pipettes, precisely reading calibrated volumes by aligning the meniscus formed by the liquid to the graduation marks on the pipette. •Keep culture bottles, flasks, tubes and their respective caps sterile during liquid transfers. •Identify different applications for plastic versus glass serological pipettes. •State accuracy limitations for micropipettors. •Precisely and accurately set volumes on micropipettors. •Know how to properly use the first and second stop on a micropipettor to aspirate and transfer correct volumes. Before starting any sterilization procedures in your work area, wash your hands thoroughly with antiseptic soap and warm water. Be sure to re-wash your hands any time you suspect you have contamination from your experimental manipulations. Clear away all materials cluttering your work area on the laboratory bench. Remove a pre-moistened disinfectant wipe from the canister and wipe down the entire area. Allow the disinfectant to evaporate - do not wipe dry! Use disinfectants such as alcohol (isopropanol or 70% ethanol) or phenolic compounds (o-phenylphenol) . To prevent aerosolization, or the production of a fine mist containing bacterial cells, and spread of microbial contaminants, avoid dispensing disinfectant from a squeeze bottle. Desiccation of microorganisms is one of the most effective ways to decontaminate surfaces. Even if someone has recently used the laboratory bench and the bench top was wiped down with disinfectant, ALWAYS begin your laboratory time by wiping down the bench. After the disinfectant has dried completely, use an igniter to light the Bunsen burner. Adjust the flame so that a blue cone can be seen in the middle of the flame. 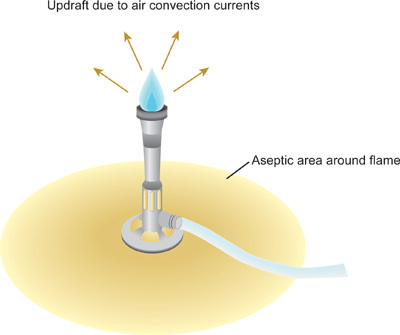 The flame is now producing an updraft, or air convection currents in which warm air rises up and away from the flame (Figure 1). As heat rises, microorganisms and dust particles are forced upward and away from the immediate work area. Work slowly, carefully, and deliberately at all times within this area created by the Bunsen burner, referred to as a sterile field. Keep the Bunsen burner on during the entire procedure. The tip of the blue cone is the hottest part of the flame. Be careful not to disturb the updraft by rapid movements that dramatically change the air currents around the laboratory bench. Creating an updraft with the Bunsen burner minimizes the possibility of microorganisms and dust falling onto the bench or into open bottles, tubes or flasks in the work area. Arrange all the supplies needed for the procedure on the laboratory bench near the sterile field. Make sure all the materials are properly labeled. Supplies may include serological pipettes and micropipettors, sterile culture tubes, sterile flasks, media bottles containing broth, sterile microcentrifuge tubes, micropipettor tips, racks for tubes, bacterial cell cultures, and phage stocks. Liquid media should be sterilized in an autoclave at 121 °C for at least 15 minutes on the liquid setting. Larger volumes of media (> 1L) require longer autoclave times. Labware should be sterilized in an autoclave at 121 °C for at least 30 minutes on gravity (dry) setting. In general, sterile solutions may be stored at 4 °C for up to 5 months. Note that storage time is significantly reduced for solutions containing unstable components such as antibiotics - always check the manufacturer's recommendations. Serological pipettes come in many sizes and options: plastic or glass, disposable or reusable, plugged or unplugged. These are calibrated to deliver volumes ranging from a 0.1 ml to 25 ml. Common sizes for serological pipettes are 5 ml, 10 ml and 25 ml and should be used for aseptic liquid transfers of 0.1 ml or more (panel A of Figure 2). There also are larger serological pipettes that can deliver volumes up to 100 ml; however, the focus of this protocol is on the more common, smaller sized pipettes. Pre-sterilized pipettes with a cotton wool plug are needed for microbiology and tissue culture experiments. The plug should not be removed from the top of the pipette; it is designed to function as a barrier to overfilling the pipette. Different applications call for plastic versus glass serological pipettes. Glass is needed for organic solvents. Either can be used when performing BSL-1 experiments on the laboratory bench top. Only plastic may be used when working in a Biosafety cabinet with BSL-2 organisms where a Bunsen burner cannot be used. It also is recommended that plastic be used for applications involving transfer of molten agar. Serological pipettes are of two types: TC ("to contain") or TD ("to deliver"). TC pipettes deliver all the volume, including the tip, and must be "blown out" or rinsed to get the specified volume. TD pipettes are calibrated to leave a tiny bit in the tip that should not be delivered. Be sure to check the label on the body of the pipette near the top to ascertain which type it is (Figure 3). The most commonly used are TD pipettes, which are marked with double rings at the top. Take a sterile plastic serological pipette (also called a volumetric transfer pipette) and carefully remove the paper sleeve at the end with the cotton wool plug by peeling it away like the skin of a banana - do not remove the entire sleeve, protecting the tip of the pipette that will come in contact with the liquid to be transferred. Touch only the top of the pipette (above the graduation marks) with your hands. Never go into a sterile solution with a used pipette, even if great care has been taken to keep it sterile. Glass serological pipettes are typically stored in metal canisters (panel B of Figure 2). Loosen the top of the canister then carefully remove the cap, and flame the open ends of the cap and canister. Place the cap down, on its side, on the disinfected bench. Remove one pipette from the canister by holding it horizontally and gently shaking it so the tops of one or two pipettes stick out about an inch and can be easily grasped. Lay down the canister on its side and remove one pipette, but be cautious not to touch the other pipettes in the container. Do not touch the bottom tip of the pipette with your hands, and avoid contact of the tip with other non-sterile surfaces. Affix a pipette aid such as a bulb, pump, or gun to the top end of the serological pipette. Remove the paper sleeve from the plastic pipette. Hold the pipette aid in your right hand. If using a glass pipette, pass the bottom third of the pipette through the blue cone in the Bunsen burner flame for 1-3 seconds. Rotate the pipette 180° as it passes through the flame. Plastic pipettes and tubes cannot be flamed. If left-handed, hold the pipette aid in your left hand and conduct subsequent manipulations of culture bottles and tubes with your right hand. Contamination tends to occur with plastic pipettes when withdrawing the final inches of the pipette from the sleeve because the sterile tip comes into contact with the part of the sleeve touched by your hands. Remove the cap of the bottle containing sterile media. Do not place the cap on the laboratory bench but hold it between your ring finger and palm of the right hand while manipulating the pipette aid with the thumb, index and middle fingers of the same hand (Figure 4). Holding the bottle at a 45° angle, pass the rim of the bottle through the flame of the Bunsen burner, creating a sterile field around the open bottle. Although best avoided, if you must put the cap down, place it face down on a disinfected surface. With a cap that faces up, there is a greater chance of contamination from movements of objects or hands, creating air currents that cause microorganisms and dust particles to descend to the inside surface of the cap. The purpose of flaming is not to sterilize but to warm the opening of the bottle and create air convection currents up and away from the opening (i.e., updraft). The warm, rising air helps prevent dust particles and other contaminants from entering the bottle. Keep the sterile container open for as little time as possible. It is important to keeping the points of entry of airborne microorganisms to a minimum throughout the procedure. Avoid coughing, sneezing, talking, and other inadvertent movement while sterile containers are open. Never pass hands and fingers over the top of a sterile field (i.e., open bottles or flasks, the inside of tubes and bottle caps) once they have been passed through the Bunsen burner flame. Always work with an open flame when opening sterile tubes or bottles. Never have more than one tube, bottle, or flask open on the bench at a time. Flaming should be done immediately upon opening and just before closing tubes, bottles and flasks. Place the tip of the serological pipette into the bottle containing the sterile media then aspirate, or draw the sample aseptically, from the bottle. Use the pipette aid to control the flow of the sample into the pipette. 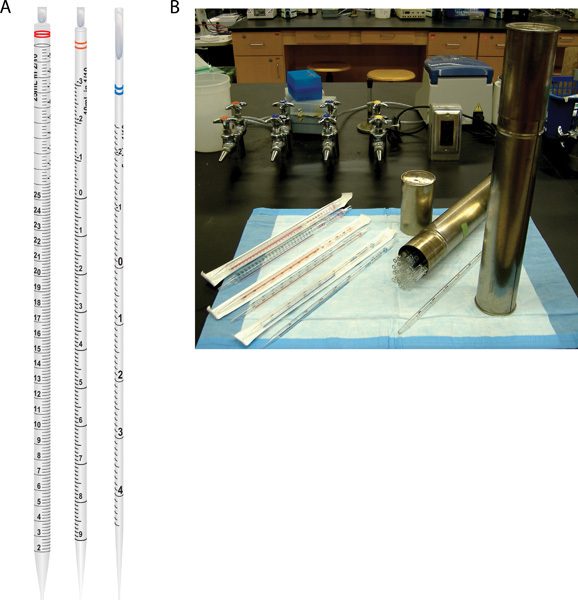 Precisely read the volume drawn into the pipette by aligning the meniscus formed on top of the liquid column to the graduation marks on the calibrated pipette (Figure 5). DO NOT MOUTH PIPET! Always use a pipet aid (pump, bulb, or gun). Pay attention to the sequence of numbers when determining the volume aspirated. The numbers may be printed tip to top, or vice versa, or often times in both directions. When reading the volume, always hold the pipette vertically, perpendicular to the ground, and view the liquid meniscus dead-on at eye level. Serological pipettes are only as accurate as the smallest marked increment, which is typically 0.1 ml for 5 ml and 10 ml pipettes and 0.2 ml for 25 ml pipettes. If greater precision is needed, a serological pipette may be used in combination with a micropipettor. Pass the rim of the bottle through the Bunsen burner flame once again, then place the cap back on the bottle. Set the media bottle aside. Don't burn yourself with the Bunsen burner in a rush to close the bottle. Hold a test tube or flask in your left hand. Remove and hold the cap as described in step #4 above. Create a sterile field by flaming the rim of the tube or flask in the Bunsen burner. Dispense the media in the pipette into the tube or flask. Control the flow of the sample so it does not splash out of the tube or flask. Volumes may be measured such that the entire volume is delivered and the pipette drains completely, or a specific volume is achieved by doing a point-to-point delivery (one volume marking to another). Pass the rim of the tube or flask through the Bunsen burner flame once again, then replace the cap. Set the tube or flask aside. Remove the pipette aid, and discard the pipette into the proper waste receptacle. Plastic serological pipettes are disposable, while glass serological pipettes can be sterilized and used again. Proper disposal requires plastic pipettes be placed in a designated sharps container (rigid box lined with plastic disposal bag) while glass pipettes initially should be immersed in a container with 10% bleach solution to disinfect the inside and outside surfaces. Then the glass pipettes should be thoroughly washed with laboratory detergent, rinsed with distilled water, and sterilized in an autoclave. These same steps should be followed when inoculating media with a bacterial culture or phage stock or when performing serial dilutions. Precisely measuring and dispensing minute volumes can be accomplished using micropipettors (also referred to as Pipetman; Panel A of Figure 6). These instruments come in different sizes each with a specific volume range: P2 for 0.2-2 μl , P10 for 1-10 μl, P20 for 2-20 μl, P200 for 20-200 μl, and P1000 for 200-1000 μl. Treat micropipettors with care, as they are precision instruments. Do not leave them lying on the laboratory bench unattended where they can be knocked off and damaged. Do not allow pipettes to come into contact with corrosive chemicals. For volumes greater than 1000 μl, use a serological pipette. Although working within the sterile field created by the Bunsen burner, do not flame micropipettors, tubes and plastic tips. The tubes and tips should be pre-sterilized. The micropipettors may be wiped down with a pre-moistened disinfectant wipe prior to use. A numeric volumeter showing the dispensed volume can be set by turning adjustment knob. Adjust the volume before proceeding to step #3. NEVER TURN THE ADJUSTMENT KNOB ABOVE THE INTENDED RANGE! To obtain maximum accuracy when decreasing the volume setting on the micropipettor, slowly dial down the thumb wheel, making sure not to overshoot the graduation mark. To obtain maximum accuracy when increasing the volume setting on the micropipettor, dial the thumb wheel up, passing the desired graduation mark by 1/3 of a turn. Then slowly dial down the thumb wheel to reach the intended volume, making sure not to overshoot the graduation mark. The volumeter shows three numbers. Depending on the micropipettor, the numbers are interpreted differently. Note that each micropipettor is only as accurate as the smallest graduation mark. P2: For volumes between 0.2-2.0 μl. The top number denotes volume in microliters. The second number indicates tenths of a microliter (0.1 μl), and the third number represents hundredths of a microliter (0.01 μl). Each graduation mark equals an increment of two one-thousandths (0.002 μl) of a microliter. P10: For volumes between 1.0-10.0 μl. The top number is for tens of microliters; this usually is set at "0" and should only be set at "1" with the other two numbers set at "0" when dispensing 10.0 μl. The middle number denotes volume in microliters. The third number indicates tenths of a microliter (0.1 μl). Each graduation mark equals an increment of two one-hundredths (0.02 μl) of a microliter. P20: For volumes between 2.0-20.0 μl. The top number in black is for tens of microliters; this should only be set at "2" with the other two numbers set at "0" when dispensing 20.0 μl. The second number in black denotes the volume in microliters. The third number in red indicates tenths of a microliter (0.1 μl). Each graduation mark equals an increment of two one-hundredths (0.02 μl) of a microliter. P200: For volumes between 20.0-200 μl. The top number is for hundreds of microliters; this should only be set at "2" with the other two numbers set at "0" when dispensing 200 μl. The middle number indicates the dispensed volume in tens of microliters, and the third number denotes volume in microliters. Each graduation mark equals an increment of two one-tenths (0.2 μl) of a microliter. P1000: For volumes between 200-1000 μl. The top number is for thousands of microliters; this usually is set at "0" and should only be set at "1" with the other two numbers set at "0" when dispensing 1000 μl. The middle number is for hundreds of microliters. The bottom number is for tens of microliters. Each graduation mark equals an increment of two (2 μl) microliters. Performance check: These instruments should be calibrated annually, ensuring accuracy and precision are maintained to stay within ± 5% of specifications. Use an analytical scale to measure water, making sure the minimum and maximum settings correspond to the intended volume. For example, use a P1000 to transfers 200 μl of water to a weigh dish on the scale. Since water has a density of 1, then 1 ml of water is equivalent to 1 gram (g). Thus, 200 μl (0.2 ml) of water should be equal to 0.2 g. Also, make sure the tip does not leak and can maintain the desired volume until dispensed using plunger system. Micropipettors must be used with plastic disposable tips at all times. Fit a tip tightly onto the end of the barrel of the micropipettor. Press down and twist slightly to ensure an airtight seal. Tips are usually packed into plastic boxes that can be sterilized by autoclaving. Open the tip box to retrieve a tip, then close the tip box to minimize contact with contaminants in the air. Some tips have filters similar to the cotton wool plugs on serological pipettes. These tips are often more expensive than regular tips and thus are used for specialized applications. For instance, when measuring volatile chemicals such as chloroform or radioactive liquids such as 32P-labeled DNA, using filter tips helps prevent the barrel of the micropipettor from getting contaminated. Hold the micropipettor in a vertical position. Keeping the micropipettor upright will prevent liquids from running inside and contaminating the barrel of the micropipettor. The micropipettor has three positions: (1) Rest position, (2) First stop, and (3) Second stop (Figure 6, panel B). The instrument has a two-stop plunger system. The first stop has two functions. The first is to draw in the desired volume of liquid into the tip when releasing the plunger from the first stop to the rest position. The second function is to dispense the majority of liquid from the tip when depressing the plunger from the rest position to the first stop. Further depressing the plunger to the second stop dispenses whatever liquid remains in the tip. Depress the pushbutton on the plunger from the rest position to the first stop. Air equal to the volume of the setting will be displaced. Immerse the tip into the liquid while holding down the pushbutton to the first stop. Do not touch the micropipettor itself to the sides of bottles, tubes and flasks; otherwise the inside surfaces of these vessels will become contaminated. Only the tips are sterile. Release the pushbutton slowly to aspirate the liquid into the tip. Stop once the pushbutton is back to the rest position. Wait a moment so liquid can be drawn into the tip. The volume of liquid in the tip will equal the volume of the setting of the micropipettor. Viscous liquids such as those containing glycerol require more time to enter the tip. Remove the tip from the liquid, and visually inspect the tip to confirm that the liquid drawn up has reached the expected level in the tip and there are no air bubbles in the tip. If necessary, expel the liquid and manually tighten the tips onto the micropipettor. Draw up the liquid and check again. Place the tip at an angle (10 ° to 45 °) against the wall of the tube receiving the liquid. To expel the liquid, slowly depress the pushbutton on the plunger to the first stop. Wait a moment then press the pushbutton to the second stop to expel any residual liquid in the tip. Depressing the plunger too quickly may cause the liquid being expelled to splatter or will produce undesirable bubbles in the tube. Before releasing the plunger to the rest position, remove the tip from the liquid. Discard tips into designated sharps waste container by pressing the ejection button on the micropipettor. When finished with an experiment requiring use of aseptic technique, turn off the Bunsen burner, then put away all supplies and reagents. Wipe down the outside surfaces of labware (bottles, micropipettors, pipette tip boxes) with a pre-moistened disinfectant wipe to ensure contaminants are not transferred to the storage location. Place contaminated glassware and hazardous waste materials into the proper disposal receptacle. Laboratory waste includes labware such as gloves, pipettes, tips, and tubes. Non-infectious hazardous waste is generated when performing experiments with non-pathogenic organisms (BSL-1) while infectious hazardous waste is generated when using pathogenic organisms (BSL-2 or above). Infectious waste must be autoclaved or disinfected before it is discarded. Follow laboratory safety guidelines described in BMBL (5th Ed.) as well as those provided by OSHA and institutional Environmental Health and Safety departments. Wipe down the entire work area on the laboratory bench with a pre-moistened disinfectant wipe from the canister, once again allowing the disinfectant to evaporate. 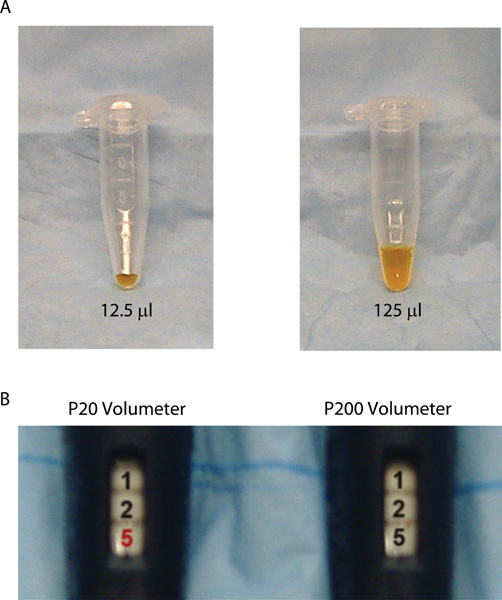 A sample application for using serological pipettes to transfer liquids is shown in Figure 7. These pipettes often are used in the microbiology laboratory to prepare media for inoculation with bacterial cultures. For example, sterile flasks first are filled with a specified volume of culture broth, in this case Luria Broth (LB), then a small number of cells (such as E. coli) are added to the media. Using a serological pipette, first the broth must be aseptically transferred from the media bottle to the flask. In this case, 25 ml of LB was added to a 125 ml sterile flask using a 25 ml serological pipette. Next, the broth must be inoculated with E. coli cells. Here, 10 μl of cells were transferred aseptically using a P20 micropipettor from a previously growing culture flask to the 25 ml of fresh LB. The flask is incubated in a growth chamber for a particular amount of time, allowing the cells to replicate (for this example, the E. coli cells were incubated overnight at 37 °C on a shaking platform). The result is a turbid bacterial cell culture that can be used for subsequent experiments. Serological pipettes also may be used to transfer media originally supplied in a bottle to test tubes, or between test tubes, as is done when making dilutions of a bacterial culture. If aseptic technique is not maintained throughout these types of media manipulations, then cultures will become contaminated, and subsequent experiments using those cultures will be delayed because fresh, uncontaminated cultures will need to be prepared. Errors occur because a sterile field is not maintained throughout the procedure. For instance, you may forget to disinfect the laboratory bench or flame the rim of a culture bottle or tube. You may touch the tip of the pipette or set the cap of a bottle or test tube on the bench instead of holding it in your hand. Proper procedure is critical for keeping contamination of media and cultures to a minimum. 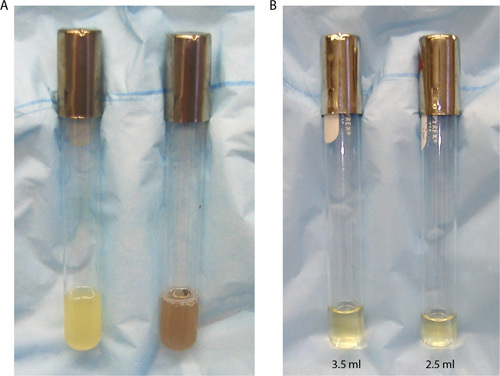 Figure 8A provides an example of a pure versus contaminated culture of E. coli in a tube containing 5 ml of LB. The left panel shows a culture displaying uniform fine turbidity typical of a pure E. coli culture. In contrast, the right panel shows a contaminated culture in which the growth characteristics deviate from those expected for this bacterial strain. Technical errors may occur when manipulating serological pipettes resulting in transfer of incorrect volumes of media between test tubes. For instance, you may read the volume on the pipette incorrectly (i.e., top versus bottom of the meniscus) or you may expel the media completely from a TD pipette, which was designed to leave a tiny bit in the tip not to be delivered. When performing a point-to-point delivery of media, you may use the wrong calibration marks and dispense the incorrect volume. Figure 8B shows an example of test tubes with correct versus incorrect volumes of media. The tube on the left contains 3.5 ml of LB measured with a 5 ml serological pipette. The student conducted a point-to-point delivery of the media in which LB was drawn up to the 5.0 ml graduation mark and dispensed to the 1.5 ml mark. The tube on the right contains 2.5 ml of LB measured with a pipette of the same size because the student who performed the point-to-point delivery of media incorrectly dispensed it from the 5.0 ml mark to the 2.5 ml mark. This mistake will result in a bacterial culture that will be at a higher concentration than planned, causing subsequent dilutions to be incorrect. This propagation of errors can result in a failed experiment that would need to be repeated with the correct cell concentrations. 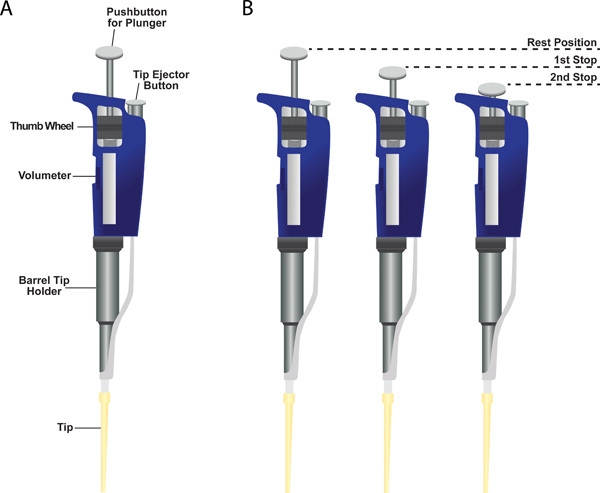 A sample application for using micropipettors to transfer liquids is shown in Figure 9. These pipettors are used for a variety of experiments in molecular biology and microbiology including preparing samples for PCR and gel electrophoresis or inoculating sterile media or buffer with small volumes (less than 1.0 ml) of bacterial cells or phage particles. In the example provided, the student transferred 12.5 μl of TE buffer into a 1.8 ml microcentrifuge tube (left tube in panel A; note that dye has been added to the buffer to facilitate visualization of the liquid inside the clear microcentrifuge tubes). This procedure required the student first to select the correct micropipettor, in this case a P20, and next to set the volumeter to the correct volume (panel B). A tip was used that contains a cotton wool plug at the end to prevent possible contamination that could be expelled from the barrel of the micropipettor from reaching the buffer sample in the tip. This precaution is not necessary if care is taken when aspirating liquids into the tips, depressing the plunger slowly so the liquid does not splash into the pipettor barrel. Technical errors may occur that result in transfer of incorrect volumes. For example, you may select the wrong micropipettor for the job or set the volumeter on the correct micropipettor to an incorrect volume. Before immersing the tip into the buffer, you may push the plunger past the first stop, causing an excess of buffer to be drawn into the tip when releasing the plunger. Alternatively, you may not immerse the tip far enough into the buffer, so air is drawn into the tip instead of buffer. You may forget to push the plunger to the second stop when dispensing buffer into the microcentrifuge tube causing less than the desired volume to be released from the tip. The right tube in panel A of Figure 9 shows a microcentrifuge tube containing the incorrect volume of buffer relative to the tube on the left. Instead of dispensing 12.5 μl of buffer, the student dispensed 125 μl. In this case, although the numbers are set identically on the volumeter, the wrong micropipettor was selected for the job (the student used a P200 instead of a P20; panel B) resulting in the delivery of a substantially larger volume of buffer. If this solution was being used to prepare a mixture of reagents for an application such as PCR, then this mistake will change the final concentration of all reagents subsequently added to the same tube. Consequently, it is unlikely that the experiment will be successful, since molecular biology procedures such as PCR require all components to be at specific concentrations for the reaction to work properly. Because it is not always feasible to ensure micropipettors (especially the inside of the barrel) are sterile, stock solutions can become contaminated causing even troubleshooting efforts to fail when performing experiments. If using micropipettors to transfer sterile solutions, it is strongly recommended that aliquots of stock solutions (media, buffer, water) be made using aseptic technique with serological pipettes. It is common to maintain working stock solutions in 15 ml or 50 ml sterile conical tubes. These are often easier to manipulate while operating a micropipettor and can be replaced with a fresh aliquot of the stock solution if contaminated during volume transfers. Figure 1. Sterile field created by updraft of Bunsen burner flame. To minimize contamination of sterile solutions and cultures, it is critical that all manipulations be conducted within the sterile field. The rims of glass culture tubes and flasks should be passed through the tip of the blue cone, the hottest part of the flame. Plastic tubes and tips cannot be flamed - these should be pre-sterilized by alternative methods prior to use. Figure 2. Serological pipettes used for aseptic transfer of liquids. (A) Shown from left to right are drawings of 25 ml, 10 ml, and 5 ml pipettes. (B) Serological pipettes may be plastic or glass. Plastic pipettes are disposable (one-time use) and typically are individually wrapped in paper and plastic sleeves in which all inside surfaces are sterile (left side). Glass pipettes can be used multiple times provided they are cleaned and sterilized between uses; these typically are stored in metal canisters (right side). Figure 3. Serological pipettes are of two types: TC ("to contain") or TD ("to deliver"). Shown is the explanatory label of a TD 5 ml pipette. Figure 4. Aseptic technique. When aspirating liquids from a bottle, flask, or tube with caps, never place the cap on the bench. Instead, hold the cap in the same hand as pipette aid while manipulating the vessel containing the liquid with the opposite hand as shown. Figure 5. 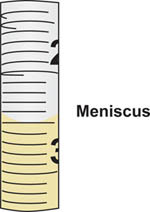 Meniscus formed when drawing liquid into serological pipette. The volume corresponds to the graduation mark on the pipette where the bottom of the meniscus aligns. In this example, the meniscus aligns with the 2.5 ml graduation mark. Figure 6. Single channel micropipettor. (A) Shown is a sample micropipettor with a plastic tip attached to the bottom of the barrel tip holder. Indicated are the locations of the volumeter, the thumb wheel for changing the volumeter setting, the barrel tip holder, the tip ejector button, and the pushbutton for the plunger. (B) Two-stop plunger system on a micropipettor. Figure 7. Using serological pipettes to transfer media into sterile 125 ml flasks. 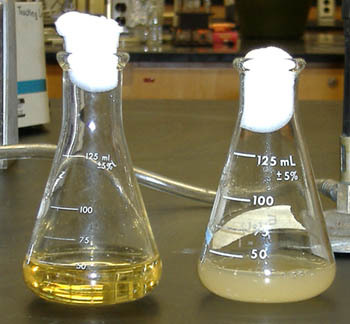 The left flask has 25 ml of media only (LB), while the right flask is a culture of E. coli resulting from inoculating LB with cells then incubating overnight at 37 °C. Note how the media in the flask on the right is turbid due to cell growth. Figure 8. Using serological pipettes to transfer media into sterile test tubes. (A) The left tube contains 5 ml of a pure E. coli culture, while the right tube contains 5 ml of a contaminated bacterial cell culture. Note the differences in growth characteristics between the two cultures. Although both are turbid, the culture on the right has been contaminated with a fungus or other airborne microorganisms giving the culture a different color and consistency from that expected for E. coli cells. (B) The left culture tube contains 3.5 ml LB while the right tube contains only 2.5 ml LB. This volume difference resulted from a mistake made while conducting a point-to-point delivery of media to the tubes. Figure 9. Using micropipettors to transfer buffer into sterile microcentrifuge tubes. (A) The left microcentrifuge tube contains only 12.5 μl of TE buffer, while the right tube contains 125 μl. Note that a dye has been added to the buffer to facilitate visualization of the liquid inside the clear microcentrifuge tubes. (B) The left volumeter is from a P20 micropipettor, while the right volumeter is from a P200 micropipettor. A common mistake is selecting the wrong micropipettor. Although the numbers are set identically on the P20 and P200 volumeter, selection of the wrong micropipettor results in transfer of incorrect volumes. Figure 10. Laminar flow hood used to prevent contamination of solutions and cultures. 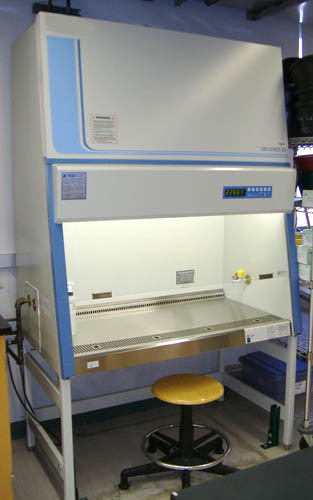 Shown is a biosafety cabinet approved for work with BSL-2 organisms. Aseptic technique refers to a set of routine procedures done to prevent sterile solutions and cultures from becoming contaminated by unwanted microorganisms in the laboratory. 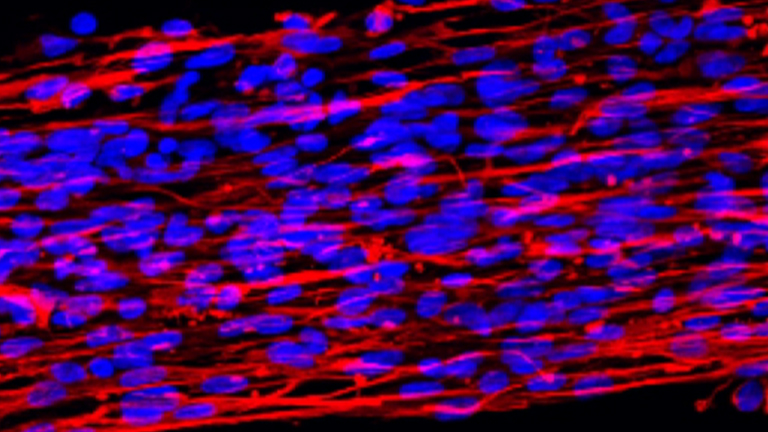 Such techniques are essential for experiments that require growing cells. Although a work setting that is completely sterile cannot be achieved, procedures such as disinfecting laboratory surfaces, creating a sterile field using a Bunsen burner, limiting exposure of uncapped cultures and media to the air, sterilizing materials such as bottles, tubes and glass pipettes, and avoiding contact of sterile instruments with non-sterile surfaces reduces the possibility of contaminating solutions and cultures in an experiment. The goal is for these precautionary procedures to become second nature; this comes with training and practice while working in a laboratory. 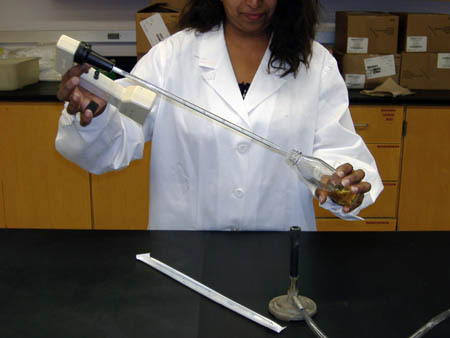 Volume transfers with sterile solutions and cultures using instruments such as serological pipettes and micropipettors are one of many types of routine techniques done in a laboratory. Different experimental applications call for instruments capable of transferring distinct, yet precise and accurate, volumes. Serological pipettes are used in microbiology laboratories to prepare cell cultures requiring media preparations involving milliliter volumes, while micropipettors are essential to molecular biology experiments that need only microliter amounts of solutions. When aseptic technique is practiced with these instruments, contamination is minimized during volume transfers regardless of amount of liquid or type of experiment. Although not discussed in this protocol, one other means commonly used to prevent contamination is to work within a laminar flow hood (Figure 10). This equipment is critical for tissue culture and for experiments performed with microorganisms classified as BLS-2 or higher. A laminar flow hood contains a HEPA (high-efficiency particulate air) filter that removes airborne contaminants from the air flowing into the hood while preventing unfiltered air from the room from permeating the workspace. Of note, a Bunsen burner cannot be used inside a laminar flow hood because the heat from the flame disrupts air flow essential to the functionality of the hood. It is often helpful to check the quality of your aseptic technique when performing experiments. To confirm solutions and culture media do not get contaminated during experimental manipulations, always prepare a negative control. For example, if preparing tubes of broth for growth of bacterial cultures, do not inoculate one tube leaving only sterile media. Incubate the medium alongside the inoculated tubes then inspect uninoculated control tube for signs of contamination such as turbidity from growth of unwanted cells unintentionally introduced into the tube. If the control tube is contaminated, the experimental tubes likely are contaminated as well, and the experiment will have to be repeated. These precautionary measures should be done with every experiment. Special thanks to Cori Sanders at Iroc Designs for preparing illustrations and to Kris Reddi at UCLA for setting up sample cultures for figures. Funding for this project was provided by HHMI (HHMI Grant No. 52006944). Barker, K. At the Bench: A Laboratory Navigator. Cold Spring Harbor Laboratory Press, Cold Spring Harbor. New York. (1998). Biosafety in Microbiological And Biomedical Laboratories (BMBL). 5th Ed, US Department of Health and Human Services (DHHS), Centers for Disease Control and Prevention (CDC) and National Institutes of Health (NIH), U.S. Government Printing Office. Washington DC. Available from: http://www.cdc.gov/biosafety/publications/bmbl5/index.htm (2009). Bykowski, T., Stevenson, B. Aseptic Technique. Current Protocols in Microbiology. Appendix 4, Appendix 4D (2008). Coté, R. J. Aseptic Technique for Cell Culture. Current Protocols in Cell Biology. Chapter 1, Unit 1.3 (2001). Grimes, S. E. A basic laboratory manual for the small-scale production and testing of I-2 Newcastle disease vaccine. RAP Publication. AC802/E, 12-13 (2002). Guzman, K. Pipetting: A Practical Guide. The American Biology Teacher. 63, (2), 128-131 (2001). Sambrook, J., Russell, D. W. Molecular Cloning - A Laboratory Manual. 3rd Ed, Cold Spring Harbor Laboratory Press. Cold Spring Harbor, New York. 978-087969576 (2001). Seidman, L. A., Moore, C. J. Basic Laboratory Methods for Biotechnology: Textbook and Laboratory Reference. Prentice Hall, Inc. Upper Saddle River, New Jersey. (2000). Pipettes, Calibration & Repair Service - Pipette.com [Internet]. Available from: http://pipette.com/public/staticpages/guidetopipetting.aspx (2012). On-Line Resources for Biology: Table of Contents [Internet]. Available from: http://abacus.bates.edu/~ganderso/biology/resources/index.html (2012). PIPETMAN P User's Guide. Gilson Inc. Available from: http://www.gilson.com/Resources/LT801120_a_eng_030209%20BD.pdf (2012). Sterile Technique - Laboratory Wiki [Internet]. Available from: http://lab.wikia.com/wiki/Sterile_Technique (2012). Air displacement pipette - Wikipedia, the free encyclopedia [Internet]. Available from: http://en.wikipedia.org/wiki/Air_displacement_pipette (2012). Disinfectant - Wikipedia, the free encyclopedia [Internet]. Available from: http://en.wikipedia.org/wiki/Disinfectant (2012).